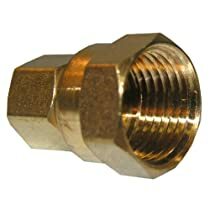 LASCO Plumbing Specialties 17-6637 is a 3/8-Inch Compression by 1/2-Inch Female Pipe Thread Brass Adapter. Female adapter. Lead free brass construction. Lead free approved product in all states. Used with plastic and copper tubing. 3/8-Inch compression by 1/2-Inch female pipe thread.